Ultimately this post was inspired by a visit to a local market. On display was a variety of goods, mostly from the independent entrepreneur. Decorated chairs, cushions, bunting – all looking lovely and I’m sure every home should have these items, and of course food. None of which I may add was gluten free. And why oh why, is everything so expensive? Why do these small independent markets, feel it is an opportunity to fleece the general public of their well-earned cash? But let me not deviate from the recipe. Rant over. But the post is also about something traditional and accessible to all, something that I certainly had as a child. 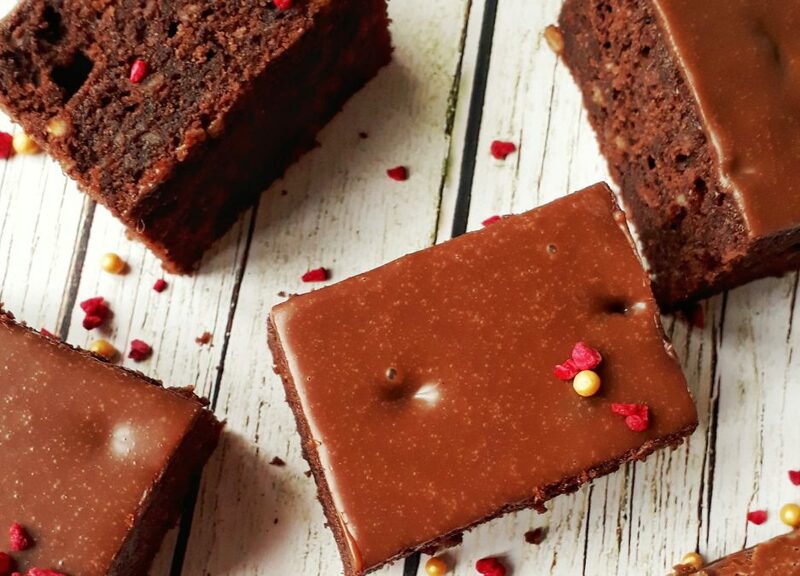 Something that is also easy to make for those who need to eat gluten free. And based on my recent market visit, can be done so much better, tastier, and cheaper! Who remember this humble Cornflake Cake? 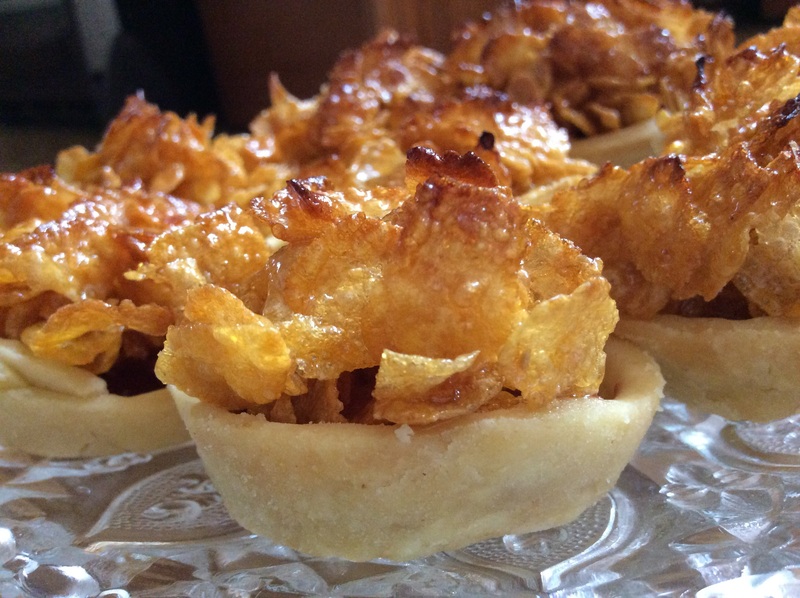 Crispy sweet pastry, a rich layer of jam and the crunchy, caramelised cornflake topping. And its all gluten free.. I wanted to get a nice deep pastry case for these, so used a 12 hole muffin tray, and an 11cm cutter. The recipe make approx 12 small gluten free cakes. Mix the flour and butter to form breadcrumbs, then mix in the egg yolks and sugar. Bring to a dough with the cold milk. Leave to rest in the fridge for about 30 mins. Once the time is up, knead the dough lightly to make it pliable enough to roll out. Cut out the rounds then re-roll the dough to get the required amount out. Leave to rest once more for about 15 minutes. These will then to be pricked with a fork, before being baked blind – 10 minutes with the baking beans and 10 minutes without. Baked in a pre-heated oven – 180c middle shelf. Once done remove from the oven and leave to cool while you prepare the filling. Turn the oven up to 200c. The filling is the really easy bit. Then stir in 180g Gluten Free Cornflakes. Mix this altogether. The gluten free cornflakes all need to be covered in the syrup mix…. Fill the cooled empty pastry cases with a tablespoon of you choice of filling – I used Mrs Darlington’s Raspberry Jam, but you could also use curd – lemon or otherwise. Fill and top with the gluten free cornflake mix. Allow to cool slightly in order for this hardening to happen, and serve warm with custard or cream or leave to cool completely and they are just as good cold. So those so yummy! Never heard of these before but will definitely have to try them out!